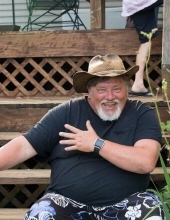 Larry A. Wateska born March 13, 1956 in Harvey, IL, passed away at the age of 62 on April 8, 2019. The unexpected passing has affected his family and friends tremendously. Larry lightened up every room he walked in and changed the atmosphere bringing joy and love to everyone around him. He will be missed by all. Larry is survived by his loving daughter, Kristina (Justin) Fugger of Plainfield, IL; his cherished grandchildren, Jori, Owen and Adelyn Fugger; his loving siblings, Linda (John) Keith of Peotone, IL, David (Chiemi) Wateska of Irvine, CA, and Daniel (Anna) Wateska of Huntington Beach, CA; his dear nieces and nephews, Johnny Keith, Becky (Rocky) Clark, Jennifer Keith, James Wateska, Taketo Hayashi, Liefie Wateska, Preston Wateska, Blake Wateska and Spencer Wateska, and their families. He was preceded in death by his parents, Ted and June Wateska. Larry was a true outdoorsman. He loved spending his free time fishing, gardening, and enjoying the surrounding nature of his lakehouse. He was a gifted craftsman and was an amazing woodworker. Larry loved his Lord Jesus Christ and was very involved in his church, Christ Church at Lake Gage. Above all, Larry loved spending the winter months with his family and traveling the country with his dear friend Steve Hull. Visitation will be Friday, April 12, 3:00 until 8:00 PM at the Overman-Jones Funeral Home & Cremation Services, corner of Routes 30 & 59, Plainfield. Interment will be private. To send flowers or a remembrance gift to the family of Larry A. Wateska, please visit our Tribute Store. "Email Address" would like to share the life celebration of Larry A. Wateska. Click on the "link" to go to share a favorite memory or leave a condolence message for the family.